This is an after-action report about a meetup with the Malmö Ruby Brigade. Yesterday, I had the great pleasure of introducing my friends, new and old, of Malmö.rb to the presenters of the day. 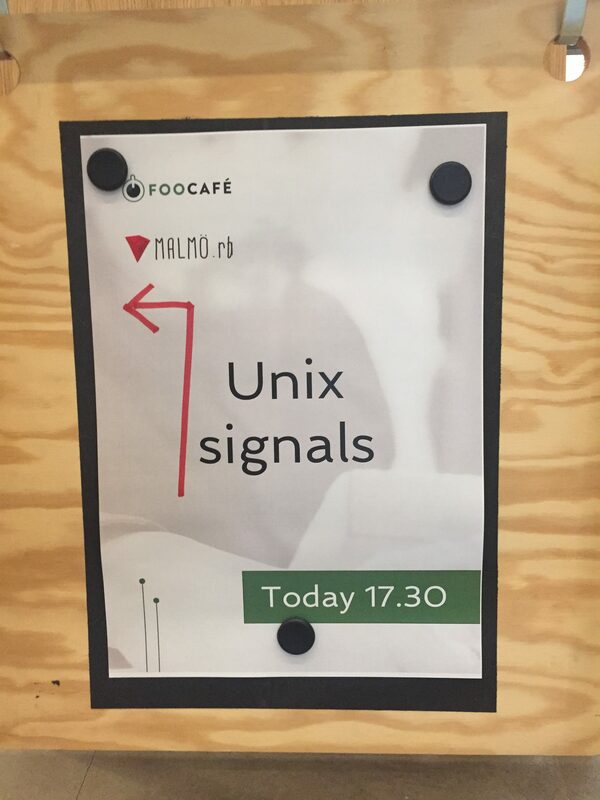 We convened, as always, at FooCafe, which is a “conference which is on every day”. I had been stressing about logistics, trains were running late, and people were filtering in, finding the room. People were giddy, and did not seem to mind the event starting later; they were ogling the amazing boxes which were on the tables at the front. After the flood of text messages to make this happen, this was now… happening. 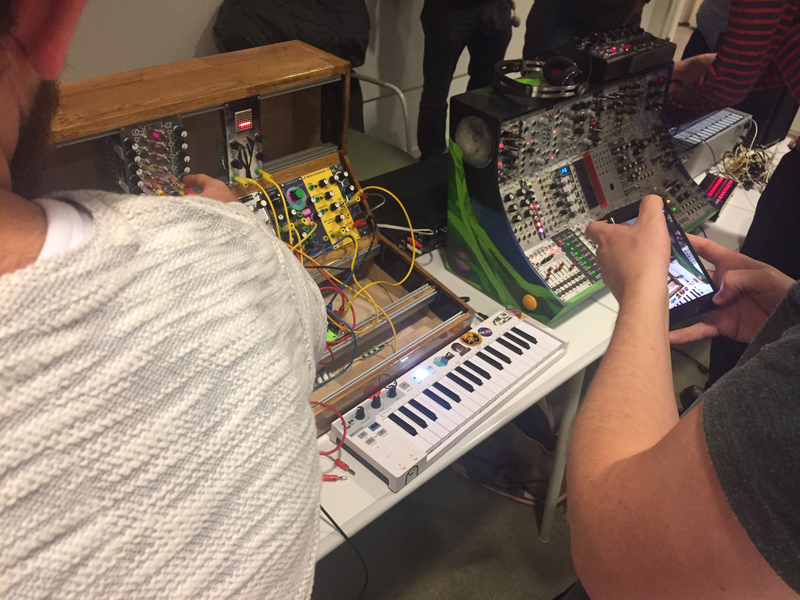 Three operators & builders of modular synthesizers showed up with their cumbersome gear. Thanks, co-organizer Lars, who drove them there and back again! First, as I had requested, Stephen from Copenhagen.rb ran a clear and wonderful set of code examples of using UNIX signals in Ruby programs. It was a strong introduction to the topic. 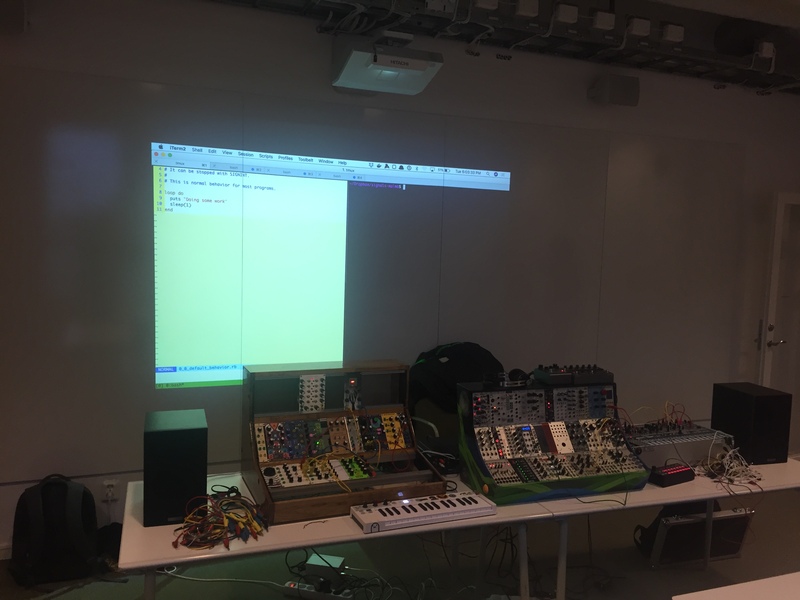 Lars is exploring the diagram, which features waveforms, ADSR envelopes, inputs and outputs. The connections on the synths is done using cables. The cables connect inputs and outputs on modules. The voltages on the cables control.. things. Each connection does something. Without names for the connections – in programming, in contrast, most everything is named – it’s possible to do things, and not recall afterwards how a configuration came to be. A cognitive ceiling. The operators were kind and helpful and full of pedagogy when explaining what was going on with the signals being sent through the cables. The voltages. When the presentation of concept was finished, we had a pizza break – thanks, FooCafe! – and then went on to turn knobs and move cables on our own. The operators explained what was going on at all times, which gave me a lot of respect for their craft: modeling the signal at all times, what it “does now”, is a big task. Well, if you took any pictures of this event, I’d be happy to add them to this place. 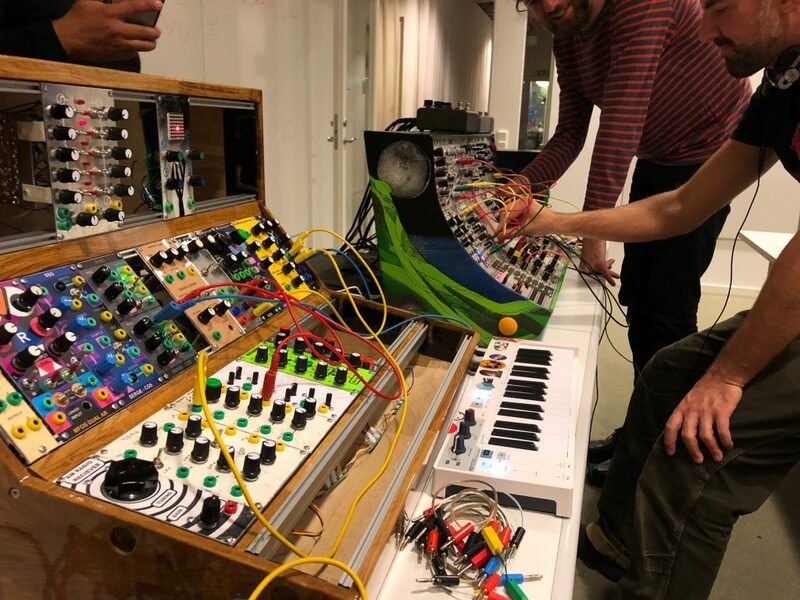 Wikipedia’s entry on Modular Synth has pictures, histories, links, etc. All the things about the Sixties that I wanted to keep out of this more hands-on workshop. Malmö.rb homepage has contact information for the group. I usually tag content with the #malmorb hashtag.